Regardless of your wetsuit needs, Wetsuit Wearhouse offers a large variety of men's wetsuits for any sport! Wetsuits are made of neoprene and provide complete sun protection, so you can rest assured that you'll stay safe outdoors while wearing your wetsuit. Wondering how exactly they work? Wetsuits allow water to seep into your suit and stay between the inside of the wetsuit and your body. Your body heats the trapped water and your suit begins to act as an insulating layer. Wetsuits work well for any water activity when you need insulation or protection from abrasion or harmful UV rays. Here at Wetsuit Wearhouse we offer wetsuits specific to any watersport including: surfing, SCUBA diving, wakeboarding & waterskiing, wind sports, water aerobics, and even industrial wetsuits. Buy men's wetsuits online at Wetsuit Wearhouse and save some serious cash! 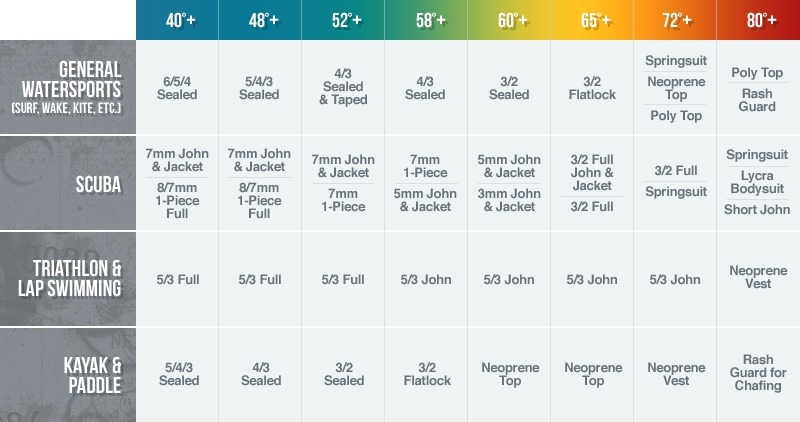 Wondering which wetsuit is best for you and your sport? The type of wetsuit you'll need greatly depends on water temperatures. Springsuits are better suited for waters of warmer temperatures, while fullsuits and hooded fullsuits are great for water temperatures ranging from cool to very cold. Another alternative are wetsuit tips and bottoms, which can be worn as layers or worn individually to provide added warmth in warmer waters (high 60's - low 70's). In addition, they offer protection against UV rays and abrasion. Rash guards, though they may not provide any added warmth, are extremely important as they primarily function to protect your skin from sun damage and board abrasion. Wetsuit Wearhouse offers a large variety of rash guards to fit all men. Looking to protect your feet, hands, or head? Checkout our selection of boots, gloves, hoods, and other men's accessories that are available.